Self-care is one of those terms that I tend to cringe at. As a perfectionist and a very busy mom of four I tend to shirk off “self-care” as superficial and simply not built into my timeframe. One thing that people don’t often realize about INFJs is that many of us are overachievers. Sure we don’t necessarily have that domineering go-getter persona (well, at least I don’t), but inside we tend to be extreme perfectionist and hold unattainably high standards for ourselves. But don’t worry, this post isn’t all about INFJs (or me). The point is, self-care is essential. It isn’t just about soaking in a tub, sipping wine, and wearing cucumbers over your eyelids…although that may be an excellent idea! It’s not all about manicures and extravagant vacations. It’s about maintaining your wellness and making time for your own interests and stress-reducing activities. When you ignore that (like I tend to do a lot) you almost always suffer the consequences. Not sure what your personality type is? Personality Hacker has the most accurate free online personality indicator I’ve been able to find. Click here to take it. (Link is an affiliate link). This post contains affiliate links. I only recommend products I truly believe in. Ignoring your own needs can make you resentful of the people you are spending all your time serving. Nobody wants that. You don’t want that, and your family and friends will be able to sense your resentment. It will almost always end up hurting relationships and making you feel worse than ever. Ignoring self care can mean serious health consequences; not only physically, but mentally. For example, did you know that laughter lowers your blood pressure, reduces stress hormones, works your abs, and improves cardiac health? Do you know what exhaustion does? It can negatively impact your heart health, make you more prone to obesity, high blood pressure and diabetes. For me, ignoring self-care means migraines, losing my hair, feeling depressed and stressed. My PTSD, which I fight daily to keep at bay, flares up more. I mean, really guys…or…me (because I still inwardly want ignore self-care) it’s time we took care of ourselves! And not just in a once-a-year way; in a regular, attainable way. So here are some options for each personality type. Keep in mind, there are LOTS of ways each type can enjoy self-care. I’d like to do a whole series about this topic that goes into more depth. But for now, this is a good introduction for each type. ISTJs are extremely focused on their responsibilities and tasks. They are driven by their goals and can get stuck in a routine of over-working or bending over backwards to meet deadlines. It’s important for them to take time for themselves; time to get away and reassess their own needs, desires, and goals. Many ISTJs find that exercising helps to clear their head, others enjoy listening to a favorite song, while others just enjoy talking over their struggles and finding solutions with a very close friend. As Si-dominant personalities, it’s important for ISTJs to take time to reflect without having to worry about deadlines, to-do lists, and social responsibilities. – Cancel non-essential responsibilities and take time for yourself. – Exercise. This will boost stress-relieving endorphins and help clear your head from worry. – Watch a favorite movie or read a favorite book. – Play a puzzle, strategy, or word game. – Take a walk in nature and notice every sight, sound, and smell. – Spend time with a trusted friend or family member one-on-one. – Catch up on sleep! ISFJs are extremely generous and devoted individuals who tend to overwork themselves in an effort to meet their family or community’s needs. They often feel selfish when they take time for their own interests, and can get so caught up in taking care of other people that they forget to take care of themselves. Many ISFJs find that one-on-one time with a good friend (a friend who knows how to really listen) is important. Other ISFJs find that time alone in nature refreshes them. – Take a moment to write down a list of your own desires and needs. You can get so caught up in taking care of other people that you forget about your own personal needs. – Vent out your feelings in a journal or with a trusted friend. – Laugh. Find a favorite comedy or TV show, curl up with your favorite snack, and let loose. – Take a walk in nature and notice every beautiful detail. Take pictures of things you find especially beautiful. – Catch up on rest. ESTJs are hard workers and tend to fill up their days with tasks and responsibilities. They may get so caught up in deadlines and projects that they forget to just enjoy the little things or appreciate what they’ve accomplished along the way. Socializing with good friends tends to recharge ESTJs, but they also need to make time to wind down and enjoy the fruits of their labors. – Engage in a relaxing, hands-on hobby like gardening, cooking, or crafting. – Exercise! This releases stress-reducing endorphins in your brain. – Take a long, hot soak in the tub and think about your many blessings. – Play a fun sport with your friends. – Relax and enjoy a favorite movie. – Watch a favorite sporting event on TV. – Catch up on sleep. – Eat a stress-reducing snack like nuts, oatmeal, dark chocolate (in moderation), or salmon. ESFJs are hands-on helpers who work tirelessly to take care of the people in their lives. They are usually looking for practical ways they can contribute to their communities and families and tend to prefer a busy life of activity and friendship. Self-care for the ESFJ often revolves around friendship; whether it’s meeting a friend for a hot cup of coffee, or taking a jog with their partner. They also need occasional time alone to refresh themselves and process all their thoughts. – Meet a friend for coffee and conversation. – Engage in a tranquil, independent activity like baking, crafting, or outdoor photography. – Exercise with a friend. – Give yourself a spa day; enjoy a facial, take a soak in a hot tub, give yourself a pedicure. – Sing along to your favorite songs. – Pick a small project that needs organizing and work on that while listening to peaceful music. – Make sure you’re getting enough sleep. ISTPs keep their minds (and hands) busy by analyzing, fixing, and troubleshooting. They are often clever mentally and skilled in technical and mechanical fields. They like to balance plenty of activities with lots of alone time to relax and refresh themselves. According to the MBTI® Manual, ISTPs like to de-stress by watching television. That said, many ISTPs I spoke with had alternate self-care preferences. You can see some suggestions below. – Do a sport that requires concentration. Something like racquetball or golf. – Go for a long drive. – Hang out on the couch with some good food and your favorite TV shows. – Play your favorite video game. – Catch up on some much-needed rest. – Snack on foods that relieve stress (nuts, red peppers, dark chocolate, and salmon are several good choices). ISFPs are a fascinating and often misunderstood personality type. They balance a bold desire for adventure with kindness, sensitivity, and compassion. People often mistake their soft-spoken demeanor for weakness, when in fact they have a certain restless bravery that drives them. They are often found in healthcare fields, business, and law enforcement and they excel in the arts and anything that uses their realistic life skills. ISFPs tend to be a high-stress type. According to the MBTI® Manual they experience high stress in relation to finances, children, health, and caring for aging parents. It’s important for these individuals to take time out of their schedule to de-stress and enjoy some quiet alone time to reflect and process their thoughts. – Get some soft blankets, a few healthy snacks, and enjoy a TV marathon of your favorite show. – Take a walk in nature and notice every sight, sound, and texture. – Get out some art supplies and create whatever your imagination brings to mind. – Journal your thoughts and feelings. – Exercise to release stress-reducing endorphins in your brain. – Enjoy some stress-reducing snacks like nuts, red bell peppers, dark chocolate (in moderation), or oatmeal. ESTPs are known for their charisma, adventurous nature, and quick-witted adaptability to life. These types are rarely flustered or overwhelmed, in fact, according to the MBTI® Manual, ESTPs experience the lowest stress of all the personality types. That said, they can still work themselves too hard, push themselves (often physically) to a breaking point, or forget to take care of their health needs. ESTPs thrive on action and actually enjoy sports more than any of the other Myers-Briggs® types. For them, it’s important to remember to rest, recharge, and take a little time for peace and quiet (before getting back into action!). – Make sure you’re getting enough rest. – Enjoy a few safe, impulsive decisions, like going out for ice cream or taking $10. and spending it anywhere. – Play a favorite video game. – Go hiking in nature. – Go on a bike ride. – Relax at home with one of your favorite TV series and a healthy snack. ESFPs are known for their compassion, adaptability, and sense of adventure. These types know how to “make lemons out of lemonade” and turn even the bleakest crisis into a positive experience. They work hard to make people laugh and feel at ease, and they also are attracted to excitement and thrills. For the ESFP self-care means balancing social time with alone time. It’s important for them to make time to process their thoughts and feelings, and it’s also important to connect with others in friendship. ESFPs tend to experience stress when trying to make long-term, important decisions. It can be helpful for them to have a good friend to confide in during times when they feel unsure about which direction to take. – Get some alone time to listen to music and process your feelings. – Go for a hike or a jog in nature and notice all the beauty around you. – Do yoga or another relaxing exercise. – Go out for dinner or coffee with some trusted friends. – Call some good friends and enjoy a carefree game night together. – If you’re feeling overwhelmed with long-term decisions, enlist the help of a trusted (but not pushy) friend who can help you sort through your options. INTJs are visionary, future-focused and logical. These types have active minds and are determined to make good use of their time. They are excellent organizers, strategists, and innovators who embrace the future with determination and logical foresight. Self-care for the INTJ means getting plenty of time alone to process and synthesize information. INTJs who rely heavily on their auxiliary function (Extraverted Thinking) can get stuck in “action” mode and be so focused on getting things done that they forget to give their mind time to wander, tinker with ideas, and access intuition. Finding time for uninhibited thought and musing is important for this type. – Cancel non-essential responsibilities and get some quality alone time. – Read a favorite book or listen to some classical music. – Play a musical instrument. – Talk to a counselor or trusted friend if you’re experiencing ongoing stress or depression. – Go to a quiet place and just let your mind wander without any real direction. Just see where your intuition might lead you. INFJs are known for their keen insights, their empathy, and their vision for the future. These individuals are often perfectionists who push themselves to an ideal that is almost unattainable. This tends to be the cause of much of their stress. They also tend to struggle with over-empathizing with the people around them to a degree where they feel overwhelmed. It’s important for them to get plenty of alone time to process and synthesize their thoughts, access intuition, and figure out their path for the future. It’s also important for them to balance this alone time with time spent around good friends or family members who accept them for who they are and are willing to listen to their thoughts and concerns. – Get some alone time to just think and process without any real direction. Let your intuition take the wheel. – Read a favorite book and listen to some classical music. – Take a walk in nature and enjoy every sight, sound, and texture. – Spend time with animals. – Talk to a trusted counselor or friend if you’re feeling extremely stressed or depressed. – Get some healthy snacks and enjoy some Netflix. – Take a hot bath or shower. Want a comprehensive guide to the INFJ personality type? Check out my eBook, The INFJ – Understanding the Mystic. ENTJs are extremely ambitious, hard-working, and determined. They love to triumph over new challenges and they continually strive to improve and tackle new skills and goals. These types may laugh at the idea of “self-care” and feel that their lives are too busy and full to take the time for it. However, they do tend to enjoy exercising to relieve stress or discussing solutions and ideas with their friends. – Get some exercise to release stress-reducing endorphins. – Eat stress-reducing snacks like nuts, dark chocolate (in moderation), salmon, oatmeal, or red bell pepper strips. – If you’re feeling stressed, take some time to re-analyze your situation and make a list of attainable goals. – Vent to a trusted friend. – Enjoy the company of good friends over dinner. – Work, but don’t overdo it (many ENTJs mentioned that work is a form of self-care for them!). ENFJs are known for their inspirational nature, their empathy, and their vision for the future. These types are often enthusiastic and full of energy and excitement about their dreams and the dreams of their friends. When it comes to self care, these types need to remember not to give themselves away to such a degree that they are physically or emotionally depleted. They tend to have a hard time saying no to anyone who needs help. So making time examine their own needs and desires is important. It’s also important for them to remember that a little alone time can be a good thing and can help them tap into their intuition and become more balanced. – Find a trusted friend to talk to one-on-one. – Exercise with a good friend. – Enjoy some time in nature; notice every sight, sound, and texture. – Get some of your favorite snacks and watch a light-hearted movie. – Think about your own personal goals and imagine ways to reach them. – Do yoga or another relaxing, quiet exercise. INTPs are independent, complex individuals who prize knowledge, innovation, and theoretical possibilities. These types love to learn and challenge themselves mentally, but they also enjoy making time for their own leisure activities. INTPs tend to balance out independent learning time with favorite activities like playing computer or video games, reading, or enjoying art. For INTPs, self-care is important because they tend to have high stress levels. According to the MBTI® Manual, INTPs experience high stress in relation to school, children, and intimate relationships. – Cancel non-essential responsibilities and enjoy some alone time. – Play a favorite computer or video game. – Get some healthy snacks and enjoy a new, interesting TV series. – Read a new, compelling book. – Take a drive or a walk in nature. – Find an independent exercise to do alone, like tai-chi, jogging, or yoga. INFPs are known for their compassion, creativity, and rich imagination. These types are often artists, writers, or counselors. Improving the world and finding creative forms of self-expression are vitally important to them. 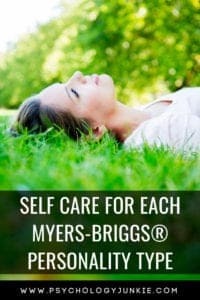 Self-care is extremely important for INFPs, because they tend to have high stress levels, and according to the MBTI® Manual, they tend to have higher instances of depression than many of the other types. It’s very important for them to get regular alone time, time for creativity, and time to reflect on their emotions and explore their own interests and desires. – Take some time to write, whether it’s journaling or creative writing. – Get lost in a favorite book! – Cancel non-essential responsibilities and enjoy some quality alone time. – Visit an art museum. – Create art, even if you’re not a pro at it. – Take a quiet walk in nature and notice all the beauty around you. ENTPs are known for their enterprising, intellectual nature. These visionaries are driven to see the potential of every possibility that crosses their mind. They tend to be optimists, and according to the MBTI® Manual they have lower stress than almost all of the other personality types (besides ESTPs). Self-care for ENTPs means making time for creativity, getting alone time to fully utilize their auxiliary thinking function, and maintaining their physical wellness. Because ENTPs have inferior Introverted Sensing (Si) they tend to forget to take care of their physical needs as they pursue endless ideas and possibilities. – Go out driving with no particular destination in mind. – Make sure you’re eating healthy and at regular intervals. – Explore new music or play an instrument. – Play a strategy game or solve a brainteaser. – Learn something new (watch a TED Talk or find a new idea to explore). – Play a sport with some friends. ENFPs are known for their enthusiasm, compassion, and endless ideas for the future. These types are driven to make the world a better place, to explore the potential of every idea, and to understand people on a meaningful level. When it comes to self-care, ENFPs need to remember to take time for peace and quiet. They are often referred to as the “most introverted extroverts” and mention the need for alone time regularly. They also need to remember to take care of their physical needs. Because they have inferior Introverted Sensing (Si) they can become out of touch with their bodies when they are focused on their ideas (which is almost all the time!). – Examine your day and make sure you’re getting enough healthy food to eat. – Listen to music or play an instrument. – Visit an art museum and immerse yourself in each picture. – Do some creative writing or journaling. – Plan a trip or adventure, even if you can’t afford for it to be a reality right now. The dream is always good. – Spend one-on-one time with a good friend. – Spend time in nature. What do you do for self-care? Share your thoughts with us and other readers in the comments!